Lama Jampa Thaye, accompanied by Dechen Dolma, visited Oxford last Saturday to give a talk to undergraduates at the request of the Levinas society. Lama Jampa and Dechen Dolma were kindly hosted by the organiser, Iain Atkinson. Lama Jampa’s talk was the second in a series of talks arranged by the Levinas society, which will see religious figures and scholars discourse on religion and philosophy. Lama Jampa gave an in depth talk, beginning with an overview of the transmission of the dharma to the West and noting a number of the obscurations that had hampered this transmission. Lama Jampa subsequently expounded at length on the authentic signs of the true dharma: the Four Seals of suffering, impermanence, selflessness and nirvana. 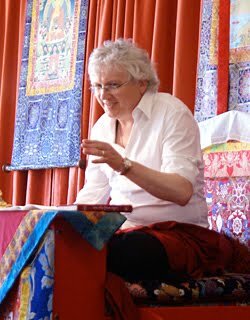 As always Lama Jampa’s erudition and gentle humour were well received by the audience. The talk ended with a brief q & a session, which saw Lama Jampa answer a number of interesting questions on rebirth and living as a Buddhist practitioner.